You drop your kids at school and decide it’s a good day for a car wash. As you pull away from Splash smiling and admiring your newly cleaned car, you spill your coffee in the front console. Oh no! Next, you take your dog for a walk and Fido promptly gets his muddy paw prints all over the seats. But wait, it gets better, you pick up the soccer carpool from practice, driving through a large puddle on the way, and find crumbs from their snacks all over the car when you get home. Your car already needs another wash!! Wait, you’re a member of the Unlimited Car Wash Club at Splash. 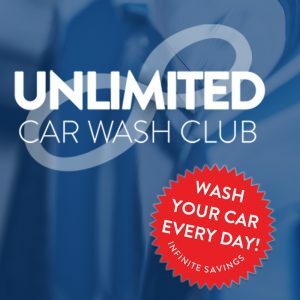 So, you decide to head back to Splash for another wash … and why not, you can get your car washed as many times as you want, whenever you want with your Unlimited membership! The benefits of UNLIMITED are endless! Do you live in Darien but often visit friends and family in Fairfield or Shelton? Buy the HOPPER PASS for just $5 additional a month and receive UNLIMITED washes at any of Splash’s 18 locations! What could be better than that! Have more than once car, join our family plan! We recently added the ability to add family members to your UNLIMITED Car Wash Club account. Head on down to your Splash location for UNLIMITED pricing today. Remember, your car deserves a better wash!